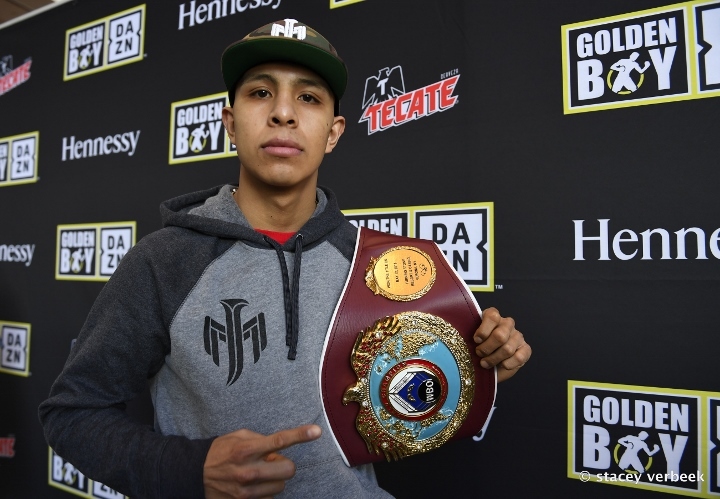 As his development in boxing is going to lead to more difficult challenges, WBO junior middleweight champion Jaime Munguia wants to devote more attention to detail, and as he prepares to make the fourth defense of his title, he has chosen to reinforce his team with the addition of a coach and nutritionist to allow him to perform better in the ring. Munguía has revealed that he added the young but experienced trainer Fernando Fernández, and also nutritionist Manuel Covarrubias, who join renowned head trainer Roberto Alcázar, coach Noé Álvarez and Jaime's father, Jaime Munguía Sr.
"The truth is that I felt very well, the main coach is still Roberto Alcázar and we have been good. The challenge is to keep advancing in each fight," said Jaime to ESPN Deportes. "I'm happy in general, I've seen many changes, I feel faster and stronger, they'll see in the next fight." Jaime will return to the ring on April 13 at the Arena Monterrey against Australian contender Dennis Hogan, who secured the position of mandatory challenger on behalf of the World Boxing Organization. Hogan is 34 years old and has a record of 28-1-1 with 7 knockouts. The evening, organized by Zanfer and Golden Boy Promotions, will be broadcast in Mexico by TV Azteca and in the United States by DAZN. "Another thing that we have been working on is the weight. We work hard to make it and we want to recover very well for the fight after the weigh-in, that's the most important thing for the whole team, that I have a good recovery," said Munguía, who is 22 years old and has a record of 32-0 and 26 knockouts. On the undercard, Mexico's Diego de la Hoya will be officially competing as featherweight after dealing with so many problems making the super bantamweight limit, which led Golden Boy to cancel two scheduled bouts. The opponent for Óscar de la Hoya's cousin will be Enrique Bernache. Pretty awesome that Munguia is about to make the fourth defense of his title within a year of winning it. Name any other boxer doing that these days. I can dig it! So far, Mungo can't spell defence. It's not like he gets hit by slick boxers, he gets tagged by everybody. Sooner or later, one of those slaps is going to hurt.